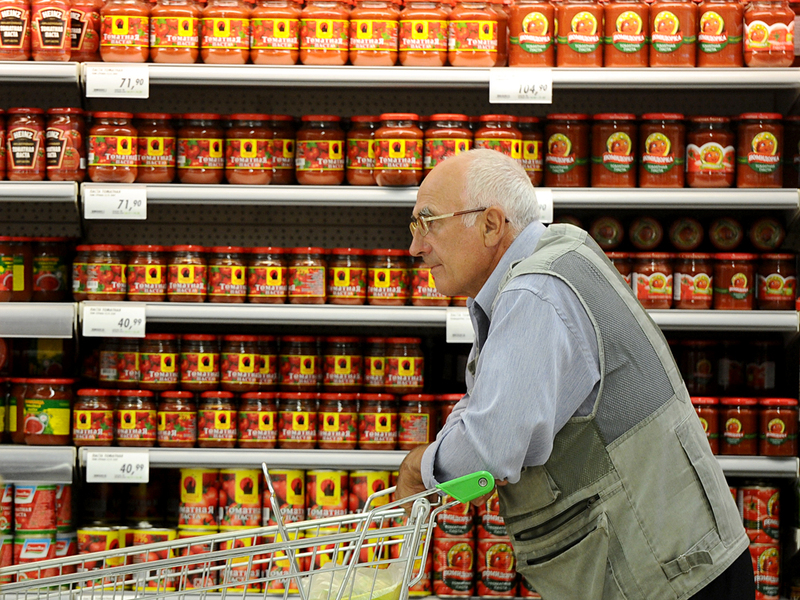 A customer at the hypermarket in Ryazan. The Ministry of Economy has published figures revealing the Russian retail sector’s worst performance in over 40 years as inflation remains high. The report also shows a rise in the number of people in the country living below the poverty line. As the financial crisis bites harder, the Ministry of Economy has recorded the worst performance in the retail trade in over 40 years and an increase in the proportion of Russians with incomes below the subsistence level to 13 percent. "One of the strategic segments of the Russian economy – retail – finished 2015 with the worst results in more than a 40-year period," said a monitoring report on the results of socio-economic development in the Russian Federation, published on Feb. 10. "The volume of retail trade turnover decreased by 10 percent compared to 2014, which is an unprecedented low since the results of 1970." The ministry notes that "the depth of the fall in food purchases in 2015 is unprecedented, it was not like this even during the crisis of 1998 and 1999, when the average income fell much more dramatically, which suggests that the current crisis, in part because of food counter-sanctions, has hit the poor – whose spending mainly goes on food – most severely." Annual consumer price inflation was 15.5 percent in 2015. "The slowdown in household income growth, the depreciation of the ruble against the backdrop of continued uncertainty in the assessment of the economic situation force potential consumers to save and spend money only on the most necessary items," said the ministry. Households are switching from consumption to savings. In 2015, people started to save on services as well, with the largest drop observed in the market of tourist services – by 9.9 percent. However, the scope of cultural services increased (by 1.7 percent). The average value of the subsistence minimum increased in 2015 by 20 percent and amounted to 9,701 rubles ($120). As a result, the poverty level (the proportion of people living on incomes below the subsistence minimum) increased to around 13 percent. According to the Rosstat statistical agency, the poverty rate in Russia amounted to 11.2 percent in 2014 and 10.8 percent in 2013.